of discovery into the sensory world, combining culinary delights with cigar enjoyment. For the first time in history, Davidoff’s Master Blenders have collaborated with six of the world’s renowned chefs to create the Davidoff Chefs Edition. The Davidoff Chefs Edition is the equivalent to a memorable culinary masterpiece. Like a perfect meal, the cigar begins gently with complex layers of subtle flavors, and builds up to a sublime and unforgettable crescendo. Memorable Toro format created to be a perfect partner to complement an exquisite meal. Robust and complex blend beginning with subtle nutty and sweet flavors that erupt into an intense peppery, yet mildly sweet gratifying Grand Finale. 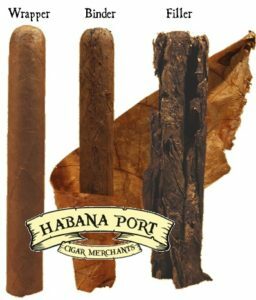 Sold exclusively by Appointed Merchants like Habana Port & CigarEarth.com. You may conveniently try the Cigar of the Month at any Habana Port Cigar Merchants location. If you live outside of Louisiana, don't fret. You can purchase your Davidoff Chefs Edition 2017 cigars from CigarEarth.com! Click here to view. I have an inclination to try cigar smoking but where do I start? "Many cigar shop employees are rude or do not want to spend the time educating me." "Cigar smoking is only for the wealthy and the elite." "Cigars are for old fogies." "There are so many brands that the world of cigars is too overwhelming for me!" "Every cigar I have smoked is too strong or too stinky." "Cigars are only for men." These are common concerns or stereotypes expressed by individuals who are curious about incorporating the art of the cigar into their daily (or weekly) routine. Because only 1% of the entire U.S. population today smokes a cigar regularly (and by regularly, we mean at least once a week), the culture of the handmade cigar is a niche and almost cult-like one. Many cigar nerds (like the ones you find manning our shops) long for the days of 1895 when 1 out of every 4 American men included cigars as a part of their personal and daily rituals. It does not help that our country has become fascist to the point that cigar smoking has been banned in many public places by most jurisdictions (but this is another topic altogether) so the practice of fine cigar enjoyment is not as mainstream, visible or accessible to the masses as it once was. The cash crop that built this country's foundation and economy and the plant that was used by the Native Americans first has been relegated to the dark. So it is no wonder that the enlightened who want to begin cigar smoking do not have many sources to satiate their curiosities. This is why we at Habana Port Cigar Merchants have decided to publish this section. Use this page as a launching pad to begin your cigar journey for that is what the art of cigar smoking is - a search for knowledge. We tell our customers all the time that you do not need to be an expert to enjoy cigar smoking. You just have to be willing to set aside some time to smoke...then, cut and light...sit back, puff away and finally enjoy yourself. You don't necessarily need to know what is the vintage of the tobacco from a particular line or who the cigar maker's family name is. It is a trial-and-error scenario when selecting and judging a new cigar. You don't even need a mastery of the English diction to describe your experiences of a particular blend (for example, Cigar X has hints of leather, berry and cocoa powder). Although many cigars may exhibit those faint traces of flavors, in the end, you simply have to ask yourself one question when judging a cigar: "Do you like it? Or not?" If so, that is fantastic. If not, move on to the next one. For every blend, there is both a fan and critic (cigar manufacturers just hope there are more fans than critics to have a profitable line). Join us over for the next few months as we begin to regularly update this page which will comprehensively introduce you to the wonderful universe that is the fine handmade cigar. Every so often, our staff members will even post a video of particular cigar topics. Now we will begin our discourse of the finer points of cigar smoking beginning with the most basic...what is a cigar? The modern-day cigar as we know it is composed of three parts: wrapper, binder and filler long-leaf tobacco leaves. This product was invented in Sevilla (Seville), Spain in 1676. Of course, the Native Americans were the first people in human history to use tobacco and they smoked tobacco in "cigar form" but it was rolled in a different style. The Seville-origin anatomy makes for an easier (and less messy) experience. The wrapper (or capa in Spanish) is the outer-most tobacco leaf. This is one of the more expensive parts of the cigar because the leaf has to be aesthetically superior in quality. It can account for anywhere between 25% and 50% of the total flavor profile (depending on many factors like seed strain, priming and other terms we will get to in the future). When cigar pros visit our humidors, one of the most commonly-asked questions about a new arrival or cigar the smoker is not familiar with is, "What wrapper does Cigar X have?" The answer is one that will affect your final judgement of a blend. Think of the next cigar part as the wrapper under the wrapper. Known as the binder (banda in Spanish), this is tobacco leaf that holds the filler leaves in a nice bunch. Traditionally this was a leaf more valued for its utilitarian function rather than its flavor so it was rather neutral at one point in most blends. Nowadays that has changed and many blenders are looking to binders as a part of the flavor profile in addition to its original function. The final piece of the cigar anatomy is referred to as the filler (tripa in Spanish). Think of the filler leaves as the guts of the cigar. These are the leaves you can see when you look into the foot (bottom portion of the cigar; the end you light). The filler leaves are usually a balanced formula of ligero, viso and seco primings (we will explore these terms in a future chapter). A fine handmade cigar is made using long-filler leaves. These are leaves that are the first choice leaves; in other words, those that have not been cut nor are leftovers. When a cigar is made, there is usually scraps of tobacco that are saved to be used in short- or medium-filler cigars (this minimizes waste and these cigars are priced lower for the end-consumer). The scraps are also sold to the machine-made cigar industry (the mass-market cigar as they like to call it) to construct their wrappers known as HTL (homogenized tobacco leaf, which are the tobacco scraps and non-tobacco ingredients pressed into sheets, like particle board). One of the first questions our Certified Retail Tobacconists in our humidors ask customers when they are searching for a new blend is "What strength do you prefer?" So before we delve in to the subject, what does strength mean when discussing a cigar? The strength of a cigar is derived from the nicotine content in the blend. Nicotine is an alkaloid that occurs naturally in certain plants (famously in tobacco; there are even trace amounts of nicotine in tomatoes) and creates a biphasic experience for the individual who consumes it; in other words, its acts as a stimulant initially and then there is a relaxing feeling. If you smoke a cigar with a higher nicotine amount, it hits you harder and if you cannot tolerate the strength, you may feel light-headed, nauseous, dizzy or even sick. We rank a cigar in strength on a scale from 1 (being the mildest) to 5 (being the strongest). If one is not sure and/or he is a beginner, we recommend starting out in the mild or even mild-medium range. Each person's body chemistry is different and we have even witnessed some beginners tolerate a strong cigar from the start. But it is always safe to start out in the mild range to test the waters of your tolerance. Now this is one of the most important points to remember in your introduction to the world of the fine cigar: one is not to inhale when smoking a cigar. The point of smoking a cigar is to enjoy the flavor that you derive from the smoke of the burning leaves of a fine cigar. "It is all about the flavor," as Jose Blanco (an industry veteran) first taught us. This ends the Prologue and Chapter 1 today and we will post another topic in our Cigar 101 Series namely the topic of Flavor soon. In the meantime follow our Twitter feed as to other daily updates and major Habana Port announcements or visit either our Baton Rouge or Metairie locations and being Certified Retail Tobacconists we will be glad to discuss with you, the beginner, all the cigar basics.